However, it's now very hard to test doSomething() without also having your test depend on the correct behaviour of Helper: you can't drop a "pretend" or mock helper object in. This complicates tests in all sorts of ways. It also means that, if you were to come up with an AdvancedHelper in the future, you couldn't make use of it in your code: Helper is hardwired, leading to strong coupling between MyClass and Helper. For more background, you can read my other blogposts on DI. For now, this tutorial assumes familiarity with the general concept. 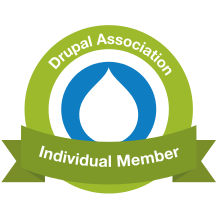 Services in Drupal are strongly Symphony, and work in almost the same way. Every module modulename can have a modulename.services.yml file in its top-level folder, and these define which service names map to which classes, and what other options the service might need to be successfully created. If the services: key already exists (you might have done these tutorials in a different order!) don't add another one: just add the d8api.example: key and what follows. But make sure you get the indentation right: only services: is unindented. anywhere in your code. But DI is more subtle than that, as we'll see. The method for injecting a service into something else depends on what you want the something else is. * An example service, with another service injected. *   The example service, injected. * Retrieve the class name of the stored example service. *   Name of the class. This might not look simple, but it's what you'd have to write anyway in order to bring in a helper service: the DI part is yet to come. You can see this class has an object __construct() method, which takes an object of class ExampleService and stores it in a protected object variable. The class name of this injected object can then be returned by another method, as a test that injection has worked. The @ symbol in the argument indicates that it's not simply the plaintext string "d8api.example", but the actual service with that name should be provided instead. In this way, the ExampleService is instantiated and injected into ExampleServiceInjected, whenever the latter is itself retrieved. No more work is necessary. "Most" objects, like forms and page callbacks, can declare they implement ContainerInjectionInterface. Plugins (which we'll discuss later) need to declare a different interface, ContainerFactoryPluginInterface. // If you're extending some other class, call its constructor. // If you're extending a core plugin class, call its constructor. Later, when we discuss plugins in more depth, we'll see examples of both of these. Even though there's a lot of code here (and we've omitted method and variable comments for brevity, which you shouldn't ever do!) it's mostly boilerplate, and only ExampleService, $exampleService, d8api.example etc. are the bits that matter. It's true that in theory, you are calling \Drupal::service(...) here in your own code, through $container->get(...); in practice, the create() code pattern strictly limits the possible side-effects of doing so. As a rule: class methods can safely access $container; but they should never pass $container to the object for its own use later on. If you've edited the d8api.services.yml file, you should rebuild caches. In order to test this code, you should also install Drush. We don't cover either process here. In this example, Drupal-as-service-container looks up the service, finds and loads the class, instantiates the object and passes it to get_class(). This then prints the class name to the terminal window. This output shows that ExampleService has been successfully instantiated and injected into ExampleServiceInjected, and the latter returned by the container. If you can see all this then congratulations! you have registered two services with Drupal, and successfully injected one into the other.